I read about the challenge at Simon Says Stamp over at Ashi Oliver's wonderful blog. I sooo love her page using Ranger Archival Ink. It is just gorgeous! She commented that we might think it odd she picked black ink as a favorite when there are so many colors available. Well, I can top that, I picked Clear! Yes, my favorite ink is Versamark. Why? Well, it is so versatile of course. Sometimes I just leave it clear and stamp as a watermark, but mostly I use it for embossing. For my card, I stamped in Versamark and embossed with Stampin' Up! 's new Early Espresso embossing powder. Then I used a trick I got from Kristina Werner in this post for her Mother's Day card. She colored on the back side of her image after embossing. I think she used Copics with her white embossing. I'm using Stampin' Up! markers and they are blending great on the vellum as the ink doesn't dry immediately. This is also a fantastic technique for someone like me who has trouble staying between the lines :-( I tell you if there was a grade for coloring in elementary school, I would have failed. So this is perfect and creates such a soft look. 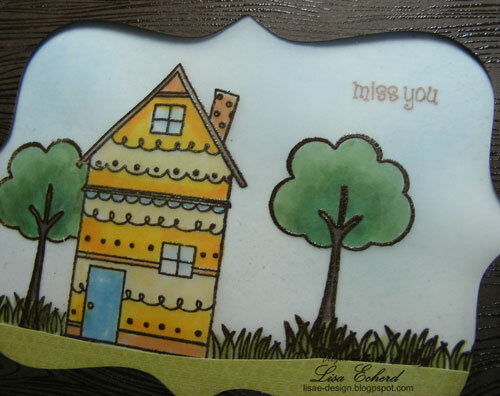 I'm using Hero Arts Whimsical Houses. The frame was cut on the Cricut. I just moved the cutting blade in a tad and then cut a shape from the Storybook cartridge. 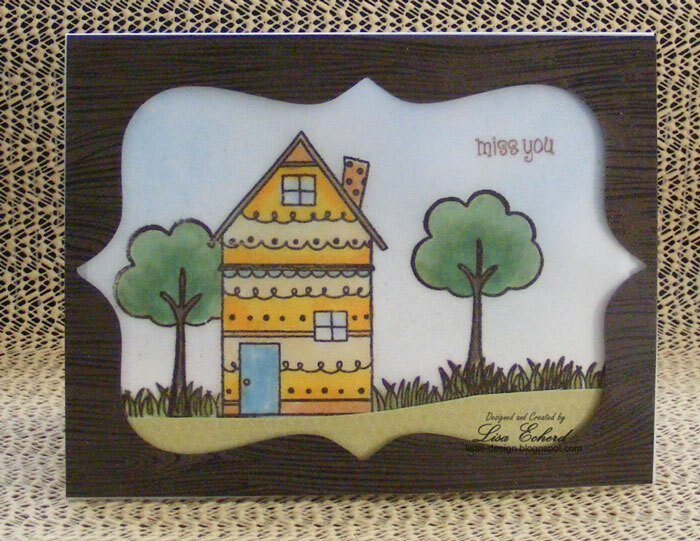 I used the negative space by cutting a border around the where the shape was and that became my frame. It is finished off with more Versamark, a wood grain stamp and clear embossing powder. This one is off to my Operation Write Home box. Thanks for stopping by today. The challenge is here at SimonSaysStamp. At first I thought you had put a filter on your photo as it looked so soft. But you used velum, such a great idea. Really cute card, Lisa! I'm glad you talked about coloring on the back side of the vellum. I've seen that before, but I always forget about it. It makes a really nice look, and I need to try it myself. Thanks for sharing. Hugs! Versamark is a good choice! Your card is just precious! I love the house, and your coloration is wonderful! Great embossing too! Thank you for getting inky with us this week here at Simon Says Stamp & Show! Fabulous card, Lisa! I never thought to color on the back side. Great idea! Love the look! What a neat technique for a fabulous card.